These drawstring backpacks are designed with strong and durable 210D polyester exteriors and contrasting PU leather reinforcement black trims at the corners. The strings are built to resist constant wear and tear and can be easily adjusted, making these suitable for people of all ages and sizes. The drawstring closure at the top ensures your items are kept safe and secured inside its main compartment. Pick from a variety of colors that include blue, forest green, orange and many more. Get you wholesale promotional drawstring backpacks printed with your logo, graphics or text using discountmugs.com D-lab system. 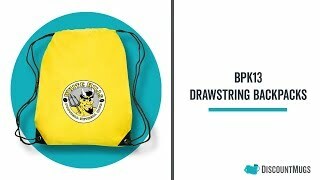 Simply select the drawstring backpacks of your liking and upload your artwork. If concerned about the quality of your artwork, a proof of your screen printed drawstring backpacks can be sent to you upon request. Love these! Have ordered multiple time and am so happy with the quality! Great quality bags! They arrived quickly. Great quality bags and awesome customer service! I bought these bags for a backpack drive and I'm sure the kids will love it. My order was one bag short but they sent me another one plus extra! Super happy with my purchase and will look forward to ordering again in the future. Was delivered in strikingly fast time. The print looked clear and bright.